Stevie is turning one! Remember his sweet newborn photos from last winter? It's hard to believe that this little December baby is a year old already. 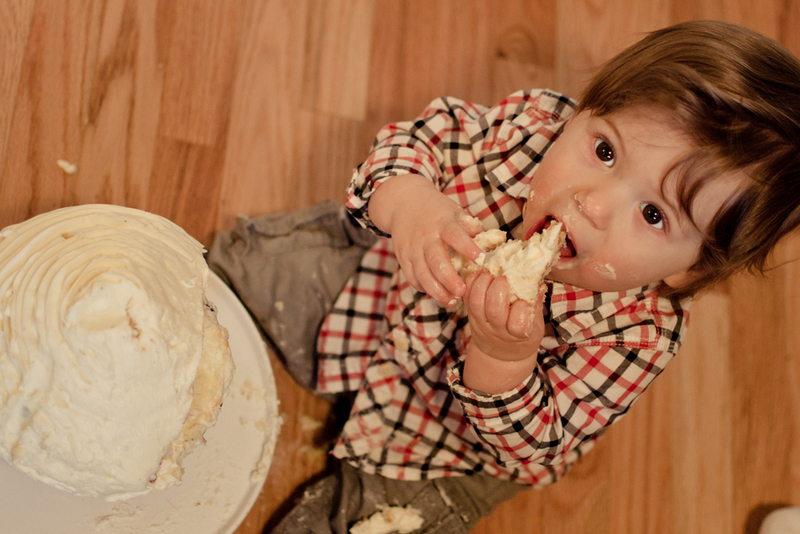 When I met his mom a year ago for his newborn session, she excitedly asked me if I did cake smashes. I love babies. I love cake (like, I REALLY LOVE CAKE). And of course, I love photography and capturing moments in time. So back then, cake smashes were something that I was so excited to get into and I was thrilled that we were already planning a session a year out. When chatting about the smash again over the summer, she asked me the most important question of all: "Is it good cake?" I reassured her that of course, it was the most delicious cake ever provided by the talented Jacqui at Cakes by J&J. Jacqui made us a gorgeous cupcake cake with a stunning chocolate base, and it was perfect. I love the photos when the cake first piques the babies' curiosity.... "Just checking things out... What IS this thing?!?!...... For ME?!?!?!" But before long he was really into it, smashing away and busting out some dance moves to show how much he was enjoying his first birthday cake. Mom, Dad, and I were dying laughing and enjoying the little show he was putting on for us. That's the best thing about these smashes -- the curiosity and the laughter that comes with the babies' pure joy and elation! SUCH a fun cake smash. I love his little expressions in these photos. What a great afternoon!